These exam materials are useful for advancing your proficiency in Japanese language study and acquiring the proper qualifications of JLPT N3. This course’s teaching materials can be used for: Beginners wanting to study general Japanese and those taking the JLPT N3. 1. 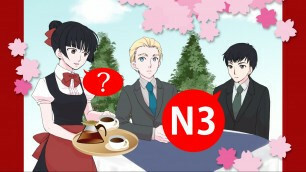 Find your weak points on the N3 level of Japanese. 2.Help you get used to the question formats and time distributions. 4. Understand knowledge which is directly connected to the exam. Print the question sheet and the answer sheet before taking the exam. Check your answers according the correct answer sheet and listening script after the exam. The listening question files are only available online.